Are you are driving your own car to La Villa de Soledad? Instructions on how to get there are very easy! Coming from San Pedro Sula or La Ceiba’s International airports, take the CA13 highway to the East. This is the direction towards the port city of Trujillo (the signs alternately say Trujillo, Tocoa and Saba). Between km. 199 and 200 you will get to fairly large bridge over the Cangrejal River that is clearly marked as “Puente Saopin”. Drive over the bridge and immediately after getting to the eastern end take a right turn. This is paved street leading into the mountains (this would be to your right) with several signs marking the “Cuenca del Cangrejal”. Take this road, which is paved for a short distance, and when the pavement finishes keep on going. From here there is a short 8 km. (5 mile) drive to La Villa de Soledad. The road is very scenic, but be aware that you will lose your cellular phone signal along the way. 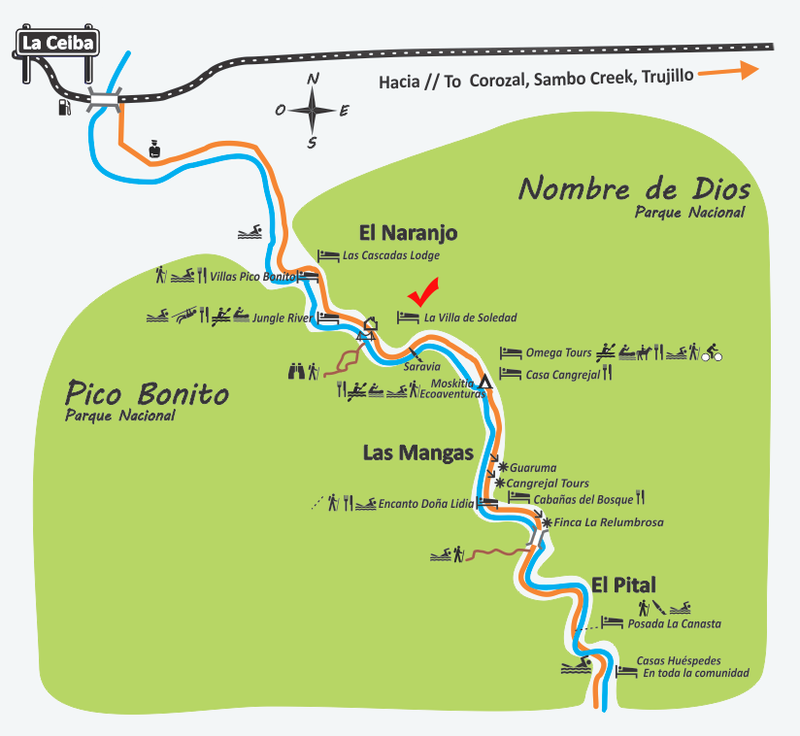 After about 7 km, you will pass a few small hotels (Jungle River Lodge, Villas Pico Bonito). Shortly after you will pass the Visitors Center for Pico Bonito National Park, where the swinging bridge is. Once you get to the visitors center you will find that tigo cellular phone signal is available once again! Claro, the other celular phone company does not have service here. If you are coming from the ferry terminal or from Trujillo, then you will take a left immediately before the Saopin Bridge. If you miss this turn, go over the bridge and use the Texaco gas station that is on your left, just after the bridge to make a u turn and come back. About 150 meters past the Visitor Center you will see a clearly marked sign on the left with a road leading up to the mountain. This is the entrance to La Villa de Soledad, which is just above the road! Bienvenido!!! Please note that access to the top of the hill requires a 4X4 vehicle. If your vehicle is not a four wheel drive unit do not try to drive up! Please park in the area clearly designated for parking and walk up the last 100 feet. If you need assistance with your bags, just honk the horn, and we will be down in a jiffy! If you have any more questions regarding directions to get to La Villa de Soledad, please contact us via email at: [email protected] or call us at + (504) 9967 4548 or 9967 4260.